ALASKA HOME | ARTICLES | GO AHEAD AND STAIR! If you're in a home with more than one level, you'll likely need steps. But why settle for boring or hidden? 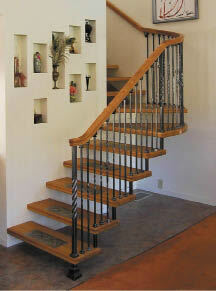 With the right design and materials, a good-looking stairway can become a focal point inside your home. 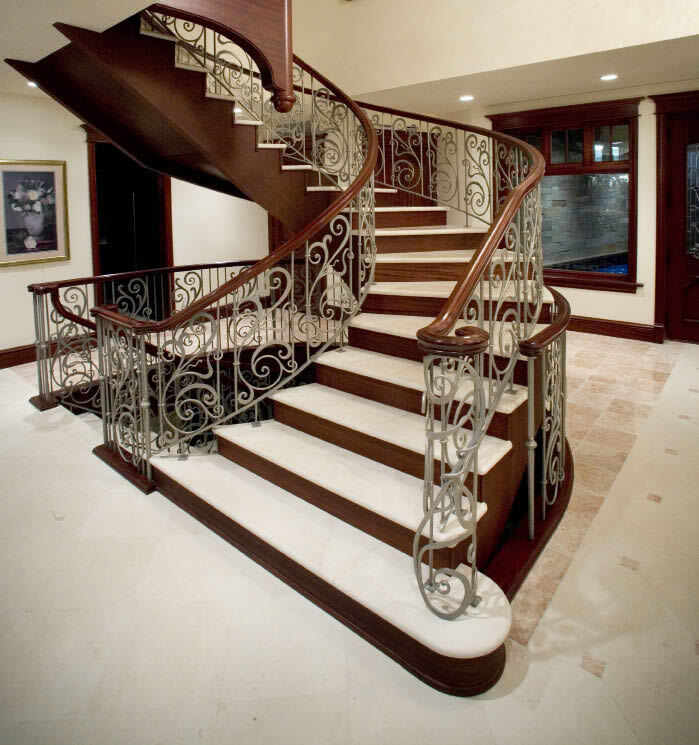 In this elegant home, the homeowner wanted a spectacular stairway to be the centerpiece of the home. 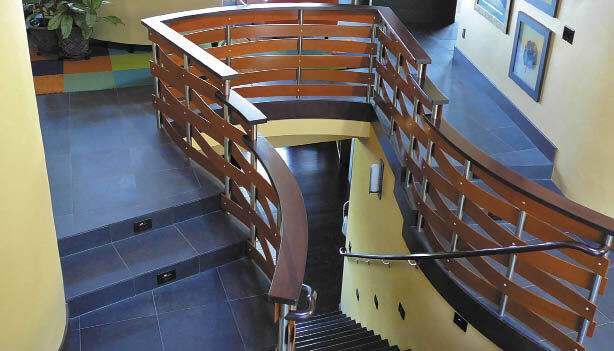 "The structural challenges were to create a 12-foot diameter floor opening to accommodate a semi-circular, custom stair. The overall stair filled this entire opening," explains architect Mark Ivy of Ivy & Co. "Also, above this stair is a cantilevered arm that supports another spiral stair measuring over four feet in diameter. This was centered and suspended above the main stair and gave access to the fourth level viewing loft." The main stair, fabricated off-site, was too large to fit through the front of the house, so it had to be craned over the building, rolled though the lower level and winched vertically into place. The rails and finishes were installed in place to integrate with the surrounding finishes." In this duplex, the floor plan had a "narrow footprint" so the design team got creative. "We wanted the room to feel wider," says architect Bruce Williams of B+W Architects. 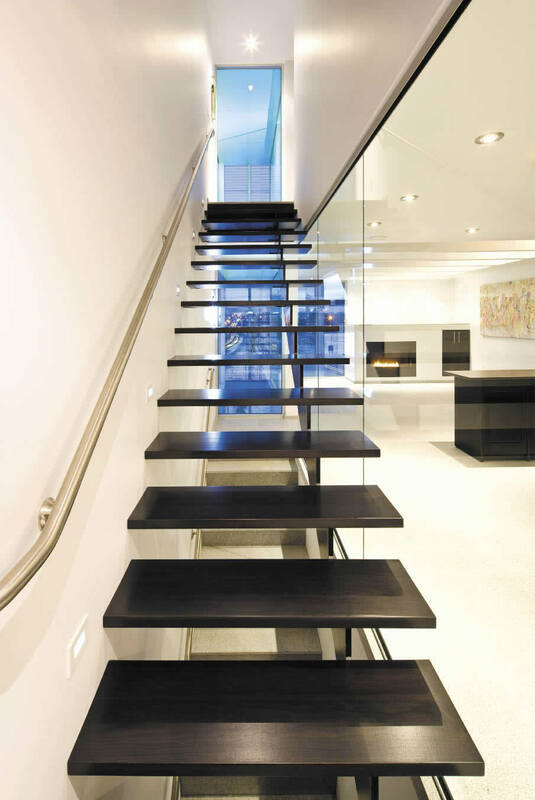 "With this in mind, we extended the perceived width of the room into the stairwell area by using a clear glass wall as the safety barrier between the steps and the adjacent space. Extending this idea even further, we wanted the stairs to feel as open and light as possible. So instead of having thick multiple stringers, we only have one." The floating treads are Brazilian hardwood to match the dark wood finishes in the adjacent kitchen and living room. A unique cantilevered staircase that keeps the wide-open feeling of the room was the goal of this staircase project. 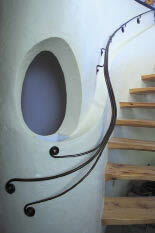 "The homeowner wanted something a bit different for this staircase," says Jeannie Boniface of NCP Design/Build. "She had seen floating staircases in a magazine and wanted something similar for her home, along with a way to display some of her smaller art along this wall. By building in nooks we were able to accommodate both of her needs, and create a gorgeous look with darker wood and black balusters against a cream background." "This circular staircase is gracefully styled with Old World craftsmanship," says Barbara Inman of Dunlap Builders. Starting with a precision-built frame kit, the box newels are made of heartwood cherry, as are the treads, risers, floor plates, handrail and shelf. The solid iron balusters, powder-coated with a gunmetal finish, were handmade by Custom Ornamental Iron Works in Canada. The elongated baskets on the balusters were forged so that each one was unique and no two baskets were built alike. This custom staircase creates a one-of-a-kind focal point in this home. "For this unusual staircase, we wanted to draw on the homeowners love of wood with a modern twist," says Jill King of Red Carrot Design. "So, being fans of mid-century modern furnishings, we went with the bent wood technique as the inspiration for the design. The woven cherry wood around the stainless steel tubes finished off with a walnut cap turned out to be a perfect combination of industrial cool vs. earthy livability." To create this whimsical staircase in Homer, "a beach-washed tree was installed and carved into the staircase," says Tarri Thurman of Moose Run Metalsmiths, the company that fabricated the handrail. 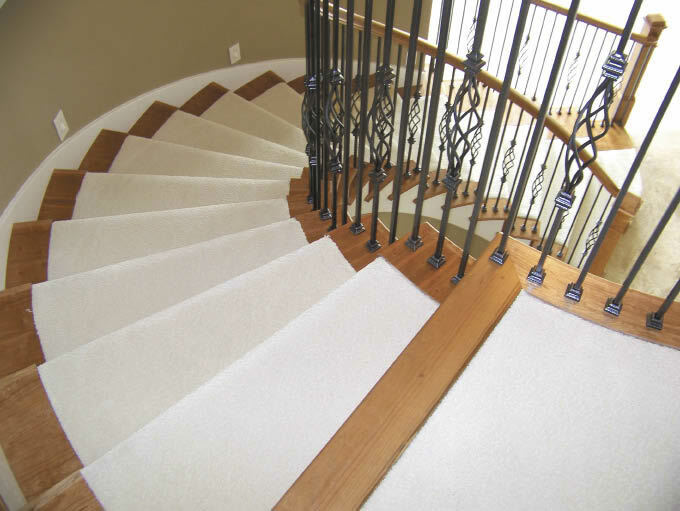 For the custom rail, made of a 1/2-inch and 3/8-inch solid steel round bar, "we had to do all of our bending and fitting on site to be able to match the beautiful curve of the staircase," Thurman says. "Back at the shop, all the solid welding and finish fabrication took place. A patina was used to give color to the metal and a durable clear coat was applied."